The set of six rings is crafted using rudimentary hand tools, and comes in the designs of a giraffe, a zebra, a cheetah, a hippo, a rhino, and a lion. Napkin rings are also a way to help you go green by encouraging the use of cloth napkins. Assign a different animal to each family member so that each person can reuse their own napkin again and again until laundry day. 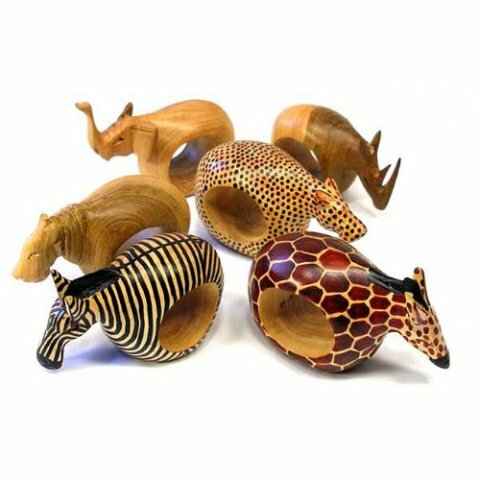 The African Animal Napkin Rings are a Fair Trade product and is distributed by a member of the Fair Trade Federation. Purchasing this product provides support to the artisans. To order you own set, click here. How to Make an Origami Turtle -- The Animal Video of the Day!! !